A team of seniors at Stevens found ESG-focused portfolios provided stronger risk-adjusted returns over the market as a whole. From left are Alec Kulakowski, Mark TenBrink, Kyle McDermott and Alex Lagasca. There’s been some skepticism as to whether ESG funds — that is, investment strategies where a company’s sustainable and ethical impacts are considered alongside traditional criteria — can compete with other growth-oriented approaches. Thanks to some data-intensive research from a team of undergraduate students at Stevens Institute of Technology, it seems ESG-flavored approaches can have both social and economic benefit. “Over a long-term horizon — from, say, 2005 to present — we saw our ESG-focused portfolios provided stronger risk-adjusted returns over the market as a whole,” said Kyle McDermott ’19, a Quantitative Finance student who’s currently working on a rotational program with UniCredit as he completes his studies. That comes with some caveats — it considers only the top-performing ESGs and is based on only one dataset — but this is the kind of work that may convince institutional and retail investors that they don’t have to sacrifice good corporate behavior for good returns. “As part of our research, we’ve read reports from companies like Bank of America and Morgan Stanley on ESG-style investing, and at least one of those reports said bankruptcies could have been prevented had investors had some ESG criteria in their portfolios,” said Mark TenBrink ’19, also a Quantitative Finance student. TenBrink, who accepted an offer with Protiviti after completing an internship there, said ESG may also become more mainstream as investors his age plan their own financial futures. “You read about how millennials don’t see salary as the end all of their jobs — benefits are important, ethics are important — and so you might see these investors willing to accept smaller returns for good behavior,” he said. McDermott did some work in the ESG space as part of an internship, and thought the concept would translate to an interesting project for the annual Innovation Expo, to be held May 3 at Stevens. The team originally wanted to create a target-date fund that would start with ESG equities and transition to green and blue bonds as an investor’s retirement approached — but the challenge with this approach was a lack of data, said Alec Kulakowski ’19. The team used tools in the Hanlon Financial Systems Center — including Bloomberg, WRDS and Sustainalytics — but because ESG is a new concept, even Stevens’ vast collections could only get them so far. Instead of a target-date fund, the team focused on creating a dashboard that will help investors make better decisions regarding ESG-based stock selection, as well as comparing S&P performance against several ESG-focused exchange-traded funds. To build the dashboard, the team turned to Alex Lagasca ’19, who’s studying Computer Engineering but has an interest in finance; he was extended an offer to return to Jefferies after completing an internship there over the summer. “We need an interactive interface so that people can see the different elements that go into an ESG fund and understand the different outputs, and how it all fits with their strategy,” Lagasca said, crediting his Stevens coursework with helping him face those challenges. The technology-centric emphasis of the School of Business also played an important role in how the team approached the project. The students were supported by professors Hamed Ghoddusi, an economist, and Papa Ndiaye, a financial engineer whose work in factor models and portfolio optimization was a big help to the team. Dr. Ndiaye encouraged the students to join an online portfolio challenge, to test their model against other actively managed portfolios. As of this writing, the team was in the top third of its competition group. The focus on ESG was an interesting exercise for Dr. Ndiaye as well as his students. The team is now completing the dashboard it will showcase at the Expo, and is also excited about sharing some of its findings about ESG performance relative to the market as a whole. 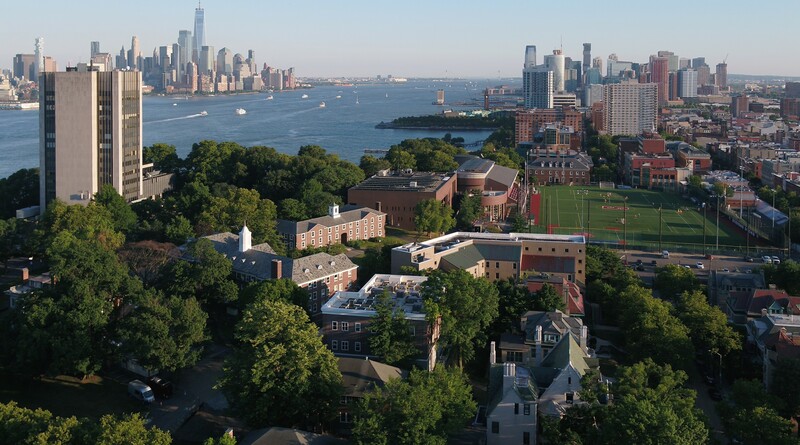 “We hope to be able to give a recommendation to the Stevens advisory board, showing that this is good for the school, and that Stevens should consider implementing some form of ESG criteria into their own investments in the future,” TenBrink said.